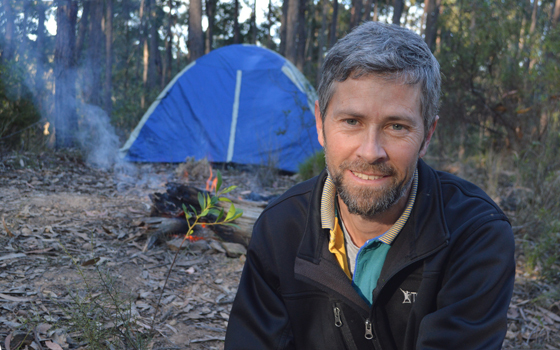 Known for his colourful personality and love of ecology, Paul is the first to admit that he’s more at home in the bush than he is in his own house in Wollongong. Before starting Nature Engagement Tours Paul worked for 12 years in childcare, and has a Diploma in childcare. He was also an outdoor education guide at school camps, where he would take kids and teenagers bushwalking and teach them about the local ecology. Paul Dickson is your personal guide, nature-lover and conservationist. It was an eye-opening experience for Paul to learn that many of the kids he came across at school camps had never been bushwalking before in their lives. It was a foreign place to them. Paul, on the other hand, had spent most of his spare time out in nature. Being able to give them a life changing experience through his own love of the outdoors is what set the foundation for Nature Engagement Tours. But the rest of the story goes back much further. One of Paul’s biggest passions is sharing his knowledge with others, especially young people. The connection with the Deua National Park comes from his early childhood when he spent most of his school holidays out in the bush with his father. As he spent more and more time in National Parks he became fascinated with the ecology and the protection of these places of wild beauty. He still remembers at the age of 11 writing a letter to the Lord Mayor of his hometown, asking him to build a sanctuary for New South Wales endangered animals. The mayor then forwarded his letter onto the local newspaper, where it was published. Clearly this was only the beginning. When Paul saw Dr Bob Brown’s success protecting the Franklin-Gordon Wild Rivers National Park for future generations, he realised we all have the power to effect change. Spurred on by this success, he and a small group of environmentalists set the groundwork for the declaration of the Deua National Park. This would mean that the old growth forests in the area would then be protected from logging. A pivotal moment in the campaign was when Paul got a call from the New South Wales Premier’s office. The then Premier, Bob Carr was an avid bushwalker himself and often went on holidays to the New South Wales South Coast with his wife. He was about to make the final decision on the borders of the Deua National Park and he wanted Paul’s input. It was Paul’s local knowledge of the Deua (and possibly the Premier’s own appreciation of the natural world), that helped cement the protection it has today. These experiences showed Paul that the key to conservation is about sharing your passion for nature with others. When you can give people experiences of connection in places of natural wonder, it changes their value of these magnificent places in a permanent and tangible way. He decided that from then on he would spend his time opening the eyes of others to the beauty of the natural world by taking them there himself, on guided nature engagement tours.